Ultimate Mobile Gaming services a Primary Service Area of 30 driving miles from Marlborough, MA (Zip Code 01752). 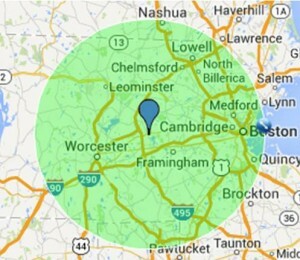 *The green area highlighted below does not include driving miles so highlighted areas may still have a travel fee. We assess a Travel Surcharge for areas outside of 30 driving miles. See the Travel Surcharge amounts below map. Use this handy application to find your distance from us! *The first distance shown is the direct line not the driving distance. Travel Surcharge (based on driving distance from Zip Code 01752): 0 - 30 Miles: No Surcharge Assessed 31-40 Miles: $15 Travel Surcharge 41-50 Miles: $20 Travel Surcharge 51-60 Miles: $25 Travel Surcharge 61-70 Miles: $40 Travel Surcharge 71-80 Miles: $50 Travel Surcharge We service the following areas: Central Massachusetts - Boston - Cambridge - Worcester - Marlborough - Framingham - Chelmsford - Leominster - Lowell - Medford - North Shore - South Shore- Rhode Island- and much more! We also travel to parts of Rhode Island and Northeast Connecticut. Wondering we can come to you? Contact us and ask!